20 June 1912-8 August 1914: Entered Army service as a Fahnenjunker in 4. Hannoversches Infanterie-Regiment Nr.164. 8 August 1914-7 September 1914: In the field with Infantry Regiment 164. 7 September 1914-7 January 1915: Wounded/in hospital. 7 January 1915-2 August 1915: Transferred to the I. Replacement Battalion of Infantry Regiment 164. 2 August 1915-1 November 1915: Transferred to Infantry Regiment 164 in the field. 3 August 1915-31 October 1915: Leader of the Training Courses for Officer Candidates in Infantry Regiment 164. 1 November 1915-26 March 1916: Company Leader in Infantry Regiment 164. 26 March 1916-10 April 1916: Sick/in hospital. 10 April 1916-15 June 1916: Company Officer in the 164th Machinegun Company. 15 June 1916-17 April 1917: Company Leader in Infantry Regiment 164. 17 Apr 1917-27 July 1919: Regimental Adjutant in the 164th Infantry Division. 6 October 1917-20 October 1917: At the same time, detached to Field Artillery Regiment 94. 27 July 1919-12 September 1919: Company Officer in Reichswehr Infantry Regiment 20. 12 September 1919-1 June 1920: Company Officer in Reichswehr Infantry Regiment 19. 1 June 1920-1 January 1921: Adjutant of the I. Battalion of Reichswehr Infantry Regiment 19. 1 January 1921-1 October 1923: Adjutant of the II. Battalion of Infantry Regiment 16. 1 October 1923-1 October 1927: Transferred to the 8th Machinegun Company of Infantry Regiment 16. 2 October 1924-18 October 1924: Detached to Machinegun Courses in Sennelager. 7 February 1927-26 February 1927: Detached to Driver Teaching Courses. 1 October 1927-1 April 1930: Transferred to the 13th Mortar Company of Infantry Regiment 16. 11 October 1937-31 March 1928: Detached to Mortar Courses in Döberitz. 1 April 1930-1 October 1934: Company Chief in Infantry Regiment 16. 6 October 1930-31 October 1930: Detached to Firing Courses for Heavy Infantry Weapons in Döberitz. 12 April 1932-29 April 1932: Detached to Firing Courses for Heavy Infantry Weapons in Döberitz. 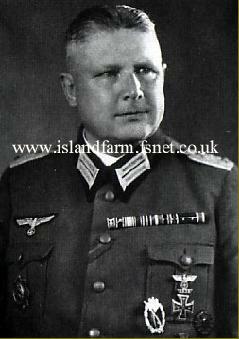 15 October 1935-6 February 1940: Commander of the 1st Machinegun Battalion. 25 April 1943-13 July 1943: Führer Reserve in the Army High Command. 3 May 1943-29 May 1943: At the same time, detached to the 4th Division Leader Course. 13 July 1943-2 October 1943: Führer Reserve in Army Group Center for employment as a Deputy Divisional Leader of the 206th Infantry Division on the Eastern Front. 2 October 1943-30 November 1943: Delegated with the command of the 7th Infantry Division on the Eastern Front. 1 December 1943-20 December 1943: Führer Reserve in the Army High Command. 20 December 1943-9 May 1945: Commandant of Fortress Bergen, Norway. 9 May 1945-17 May 1948: Prisoner of war in British captivity. German Cross in Gold: 8 August 1942, Oberst, Commander of Infantry Regiment 521. Prussian Royal Hohenzollern House Order, Knight’s Cross with Swords: 9 October 1918.